How to rip DVD to iPad Air 2/3 and play DVD movies with new iPad Air 2/3? iPad Air 2, this sixth generation of Apple tablet, is able to preorder from October 17, 2014 and will be officially released on October 24, 2014. Sequel to iPad Air, it has the same 9.7-inch display with a resolution of 2048 x 1536 pixels, but a thinner design (18% thinner than precious generation), improved 8 megapixel, f2.4 rear-facing iSigit camera and upgraded 64-bit A8X chip (40% faster CPU than Air) leading to much better performance running on iSO 8.1. 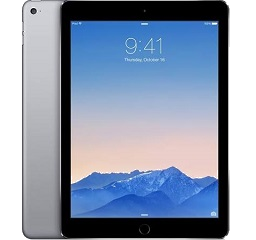 In fact, all the new features indicate that iPad Air 2 is one of the greatest devices to play DVD movies. However, you need to rip DVD to iPad Air 2/3 with a iPad Air 2/3 DVD ripper for fixing video formats incompatible problem and playing DVD movies on the new Apple tablet smoothly. How to Rip DVD Movies to iPad Air 2/3? Rip any DVDs to iPad Air 2/3, iPad Pro etc. on PC/Mac. To be frank, it is necessary to take advantage of a professional DVD ripper to make DVD to iPad Air 2/3 conversion more effortlessly. 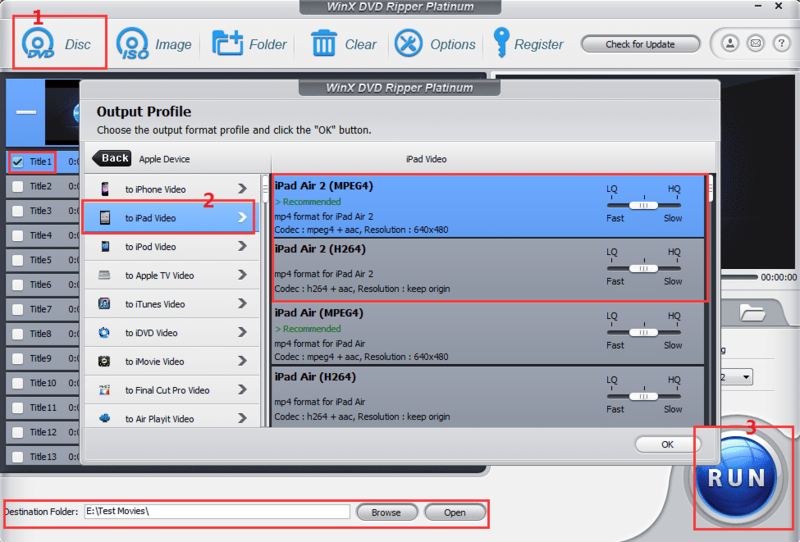 WinX DVD Ripper Platinum, the top-notch and user-friendly DVD ripping software, enables you to quickly convert any DVDs (even latest protected commercial DVDs) to almost all popular Apple devices, such as DVD to iPad Air 2/3, iPad Pro, iPad Mini 3/4, DVD to iPhone 6/6S (Plus)/SE, DVD to iPod Touch 5, and delivers high video/audio quality. The versatile editing tools and adjustable parameters are provided to meet the needs of advance option settings. 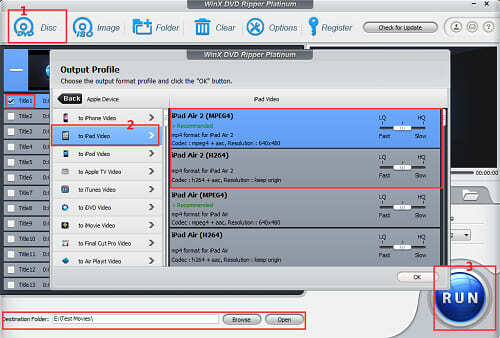 Download WinX DVD Ripper Platinum (WinX DVD Ripper for Mac) and follow the steps to convert DVD to iPad 2/3 on PC/Mac. 1. Insert DVD into DVD-ROM and open WinX DVD Ripper Platinum. Tap DVD Disc icon on navigation bar and the DVD source will be automatically detected. 2. It will take several seconds to load DVD. Once the loading process is completed, Output Profile window pops up. 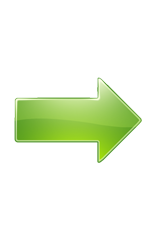 Move to Device Profile category - Apple Device – to iPad Video- iPad Air 2(MPEG4/H264). Generally speaking, the main title of DVD movie will be checked for converting by default. This DVD to iPad ripper also provides other iPad profiles, including latest iPad Pro, iPad Mini 4 and more. 3. Tap Browse to set destination folder and Click RUN button to start converting DVD to iPad Air 2/3. After DVD is finished ripping, you can sync movies with iTunes or free stream movies with video streaming software to play DVD on iPad Air 2/3 on the move. WinX DVD Ripper Platinum – Best DVD Ripper to rip DVD to videos AVI, WMV, MOV, MP4 and Apple, Android, other OS devices; 1:1 clone DVD to ISO/folder and backup main/full title to single MPEG2 file.